Online surveys are a quick and incredibly useful tool for gathering all sorts of user feedback. 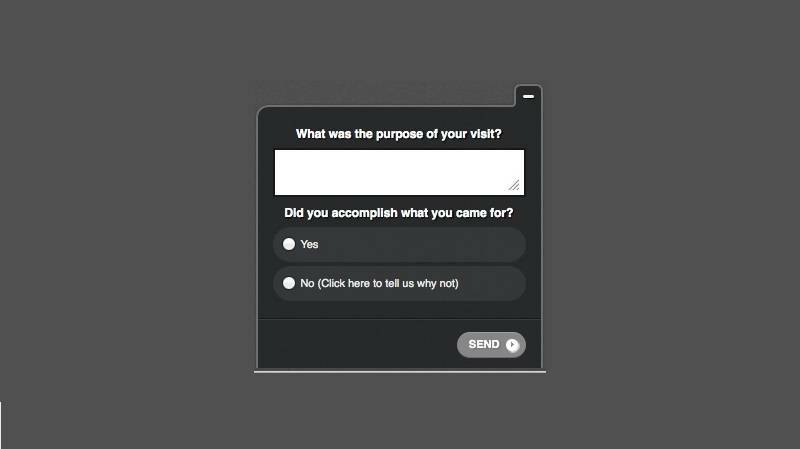 In next to no time you can whip something up using one of the many online survey tools out there (I particularly recommend SurveyGizmo) and start gathering feedback from real users. Often implementing the survey is the easy bit, it’s designing the thing that’s the tricky part as you won’t get the feedback you’re after if you don’t ask the right questions. In this article I outline 15 useful user feedback questions for online surveys for you to pick and choose from. 1. Would you recommend <website / product> to a friend? This is a great way to find out what users’ opinion of a website or product is. After all, someone is unlikely to recommend something that they don’t rate themselves. Rather than just capturing a ‘Yes’ or ‘No’ response consider providing ‘Yes, I’d recommend it because…’ and ‘No, I wouldn’t recommend it because…’ as possible answers with text boxes below each (or show the relevant text box on answer) so that you can also find out why users would or would not recommend it. 2. How would you describe <website / product> in one or more words? This is a good question for capturing perceptions of a website or product. You could allow users to enter their own words or chose one or more from a list, such as the 118 used in Microsoft’s product reaction cards (Word). A good way to analyse the results of this question is to use a word cloud generated using a service such as Wordle. 3. If <website / product> were a car, what car would it be? A bit of a wacky one but by asking users to compare your website or product to something else you can investigate their perceptions of it. For example, do they compare it to a beautiful and desirable Aston Martin DB9 or a bland and boring Toyota Corolla (sorry Corolla drivers out there)? 4. How does <website / product> compare to <competitor>? A great way to investigate the strengths and weaknesses of a website or product is to ask users to compare it to something similar that they have used. In addition to asking how the two compare you might also ask ‘Which do you prefer?’ to find out more definitively how your website or product stacks up to the competition. 5. If you were to review <website / product> what score would you give it out of 10? With most online shoppers being familiar with customer reviews and ratings why not ask users to review your website or product? You could ask for an overall rating or ask them to rate specific areas. I prefer to use a 10 point score rather than 5 point because it gives participants more flexibility. It’s also a good idea to ask ‘Why have you given this score?’ so that you find out the rationale for a rating. 6. What do you find most frustrating about <website / product>? A lot of websites and products focus on pilling on more and more features, rather than ensuring that existing features work really well. Asking what currently frustrates users is a great way to investigate how existing features can be improved. You can ask what users find most frustrating or alternatively ask for their top 3 frustrations. 7. Overall, how easy to use do you find <website / product>? Standard usability questionnaires such as CSUQ, SUS and QUIS are really good for evaluating the usability of a website or product but can be quite lengthy. This is a good single question for investigating the usability of a product or service. Possible answers could be ‘Very easy to use’; ‘Easy to use’; ‘Neither easy nor difficult to use’; ‘Difficult to use’ and ‘Very difficult to use’. Also consider asking ‘Why is this?’ if a user selects either ‘Difficult to use’ or ‘Very difficult to use’ so that you can investigate the reasons behind this a little further. 8. Why have you come to <website>? Even with analytics it can be difficult to work out what users are coming to your website for. Is it to find out some information; to carry out a transaction or something you’ve not even considered? In addition to asking why users have come to your website you might also want to ask ‘Were you successful?’ and ‘What problems did you experience’. This allows you to also investigate how well the website supported someone’s goal or task. 9. If you could change one thing about <website / product> what would it be and why? This is a great question for unearthing major frustrations or feature omissions. Asking for one thing forces users to consider what is most important to them. You could alternatively ask for up to three things that someone would like to change. 10. What features could you not live without? This is a good question for investigating killer features. Analytics will often tell you which features are most popular but not necessarily which are most important to users. 11. What do you like best about <website / product>? Along with finding out what needs to be improved about a website or product, don’t forget to also find out what currently works really well. After all, you don’t want to inadvertently change something that users currently really like. 12. What do you like least about <website / product>? A good complement to asking what users like best about a website or product. For this question you could either ask what users like or alternatively ask for their top 3 dislikes. 13. Which features could you live without? 37signals in their rather splendid book Getting Real (which incidentally can be read online for free – whoopee) state that when it comes to feature selection, “More isn’t the answer. Sometimes the biggest favour you can do for customers is to leave something out”. I couldn’t’ agree more which is why it can be a really good idea to find out which features might be pruned from your website or product. 14. How can we improve <website / product>? Send us your ideas and suggestions. This is a great question for getting general user feedback, together with feature ideas and suggestions. You might even want to think about setting up a follow up customer feedback forum, using a service such as Uservoice. This allows users to vote on ideas and suggestions that have been submitted so hopefully you can find out which is likely to be most popular. 15. Anything else you care to share or get off your chest? This is a great last question as it gives users the opportunity to sound off about anything the survey may have missed and makes it clear that you’re interested in listening to them (just don’t take any rants too personally). What sites do you recommend for creating and managing online surveys? I’ve had a go with surveymonkey and qualitysheet, both of which seem ok. Any others? I used SurveyGizmo for a recent project involving quite a complex online survey and found it to be both very powerful and surprisingly easy to use. Thanks a lot for this article! It came just in time to my needs and was very insightful to me. I noticed that you did a lot of opinion based questions. What is the role of user opinion in the rest of your ux work? Do you really find it helpful to let the visitor play designer? What kinds of insights have you learned. I realize this is an older article, but would love to hear your thoughts on this. Great article, I’ve used most of the questions here in a Survey using http://www.formmule.com which does a lot more than just survey’s, I also use it for contact form’s etc.